Today’s seasonal blog takes a trip to Christmas Past and back, starting with my early years at junior school in 1983. 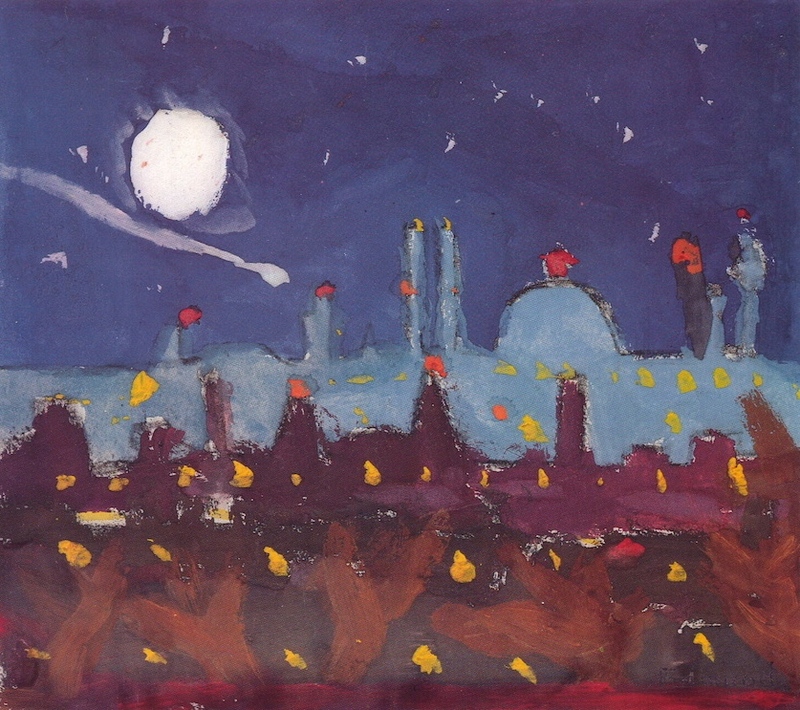 I painted a London skyline that my class teacher Mr John Pearce liked so much that he submitted it for the local borough’s schools Christmas card competition. John Pearce was (and continues to be) a highly accomplished painter and draughtsman, so it was natural for him to teach art topics at school often. He included a lesson on how to construct a landscape image - using varying lighter shades from foreground to background - to create a sense of distance. Inspired, I painted a picture with standard classroom powder paints, depicting a panoramic London skyline as seen from Alexandra Park. I was only ten years old at the time but the memory of the painting still remains vivid. I wanted the dome of Saint Paul’s Cathedral to be prominent and also the BT Tower, which was my favourite London landmark as a child. Also present was my interest in astronomy… I added the saucepan asterism of Ursa Major in the sky (notice the double marks, due to a split haired brush! ), as well as a large haloed moon and shooting star. Although I didn’t know it at the time, Mr Pearce submitted my painting for an annual Haringey schools Christmas card competition. He must have felt that the artwork’s bright street lamps, tall building lights, and inky sky evoked a Christmasy feel. Lo and behold the painting was selected for first prize and printed into festive cards, and I was featured in the local newspaper. Painting a seasonal scene today is not always easy without resorting to cliches. Because much of my work involves plein-air realism I tend to be attracted to lighting effects in contemporary settings. Old Railway Line in Snow N8, pictured here, features silver birch trees that line much of an abandoned train route between Finsbury Park and Muswell Hill in north London. It was approaching dusk when I painted the cold scene and I had to work quickly before the light faded… and before my hands froze. Another snowy scene Night Time Snow, City Back Garden N8 was painted from the comfort of my own home, looking out of a bedroom window. I have always been fascinated by the lighting and colour effects of snow, especially at night time where the streetlight reflected sky takes on a brighter, milkier hue, that appears almost artificial. Christmas decorations are always a challenge to paint, especially LED lighting which tends to be very bright and colour intense. Christmas Tree at Warren Street Station was a simple London transport themed plein-air painting featured the BT Tower once more and an LED covered tree. I wanted the general ambience and atmosphere of the place to be prominent and I was attracted to how the silhouetted buildings juxtaposed with a bright night sky. At this time of year, when most people are busily preparing things for Christmas, an artist can always find solace and adventure with painting a festive scene.